So here I am in Christchurch, New Zealand for Ulearn 09, certainly one of the biggest Ed Tech conferences in NZ, and probably one of the biggest in the southern hemisphere I would think. It’s a education conference that I’ve wanted to attend for the last few years, having only ever heard good things about it, but for whatever reason I just haven’t been able to get here for it. This year was different, and after hearing how good it was from my work colleague, @sirchriss, I was very keen to get here. Fortunately, a number of Australian educators were sponsored to attend the event this year and I was lucky enough to have my presentation submissions accepted, so here I am. It really is a beautiful part of the world, and Christchurch is a very attractive city. The conference itself is quite large, with close to 2000 delegates, 400+ workshops and presentations, 150 support staff and over 60 vendors. The logistical effort to plan and host a conference of this scale is significant and the organisers do an amazing job. I got up early enough this morning to attend the Powhiri, a kind of Maori welcoming ceremony. I’m constantly struck by the energy and pride of the Maori people, and think it’s wonderful that the two cultures of New Zealand, the traditional and the contemporary, exist together in such harmony and respect for each other. This is a country that really values their indigenous people. But mainly, today has been full of meeting people. Many of them for the first time (although I felt like I’ve known many of them for a long time.) I bumped into @janenicholls at the Powhiri, and then during the day I kept meeting more and more people who looked just like their Twitter avatars. “Hey, you’re @moodlegirl!” or “Hey, you’re @keamac!”, “Hey you’re @dwenmoth!”, etc, etc. Then of course there was the reconnecting with people I have met before, people like @rachelboyd, @allanahk and @dragon09. I also attended the unconference session in the afternoon at Boaters, where I got to meet many others and to take part in some powerful conversations. I really enjoyed the unconference – really just a very informal gathering to chat about whatever topics came up – and I got a lot out of it. After the unconference, I met up with Matt from Core-Ed to record a short video interview as part of the Edtalks series. This is another terrific NZ initiative, and involves recording short video interviews with leading teachers about some of the things they are doing with technology to make learning more engaging for the kids they teach. 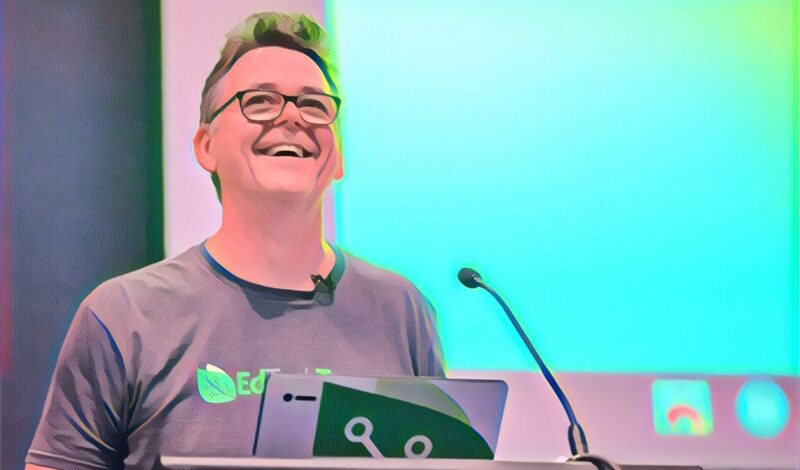 Over time the Edtalks video library has grown to become a valuable collection of good ideas and best practice for other teachers, and it was a bit of an honour to be asked to make a contribution to it. Tonight, I went to the dinner with about 40 other conference folk, where I met still more people that looked a lot like their avatars. More conversations, more great ideas exchanged, more opportunities to hear about how other people approach this incredible job called teaching. Likewise, I had a few people say to me today, “Hey, you’re @betchaboy!” as though there was almost a sense of celebrity to it for them. It’s really, really weird. After having a day full of these “Hey, you’re @that_person” moments, it made me think about how funny it is that we have these little “celebrity” moments when we meet someone that we’ve only ever know from the online world, especially if it’s just from reading their blogs, following them on Twitter or hearing their podcasts. I mean, we are all “just” teachers, and yet there is that glimmer of excitement when meeting each other for the first time. Andy Warhol once said that everyone will get their 15 minutes of fame. Maybe with the rise of global social networks, extensive personal learning networks and the notion of “celebrity” now existing way out on the edge of the long tail, we’ll all just want to get our 15 minutes of obscurity instead? 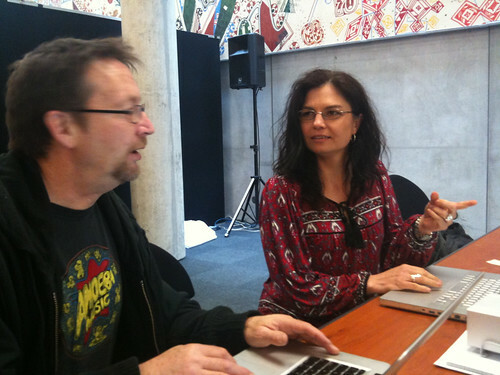 ULearn 09, Day 1 by Chris Betcher is licensed under a Creative Commons Attribution-ShareAlike 4.0 International License. This sounds like a fascinating conference. It’s great to see such an interesting in education technology: I am just now making the effort to become more fully linked, so if you have any recommendations I would love to hear them. So far I’ve joined Applebatch.com and have been pleasantly surprised by the community there. Previous PostPrevious Copyright or Copywrong?